cRadiology Division (J.L., Q.L. ), Changhai Hospital, Shanghai, China. SUMMARY: Intracranial atherosclerotic disease may constitute the most common cause of ischemic stroke worldwide; yet, in the developed world, imaging research has largely focused on extracranial atherosclerosis. Many studies in populations of Asian, African, and Hispanic descent demonstrate the preponderance of intracranial stenosis compared with carotid stenosis. This review examines the clinical presentations of MCA atherosclerosis and stenosis and the use of noninvasive MR imaging in the assessment of intracranial vasculature. MRA is a well-validated technique that offers great advantage over traditional angiography. Advances in high-resolution MR imaging of MCA stenosis have the potential to yield excellent visualization of plaque. 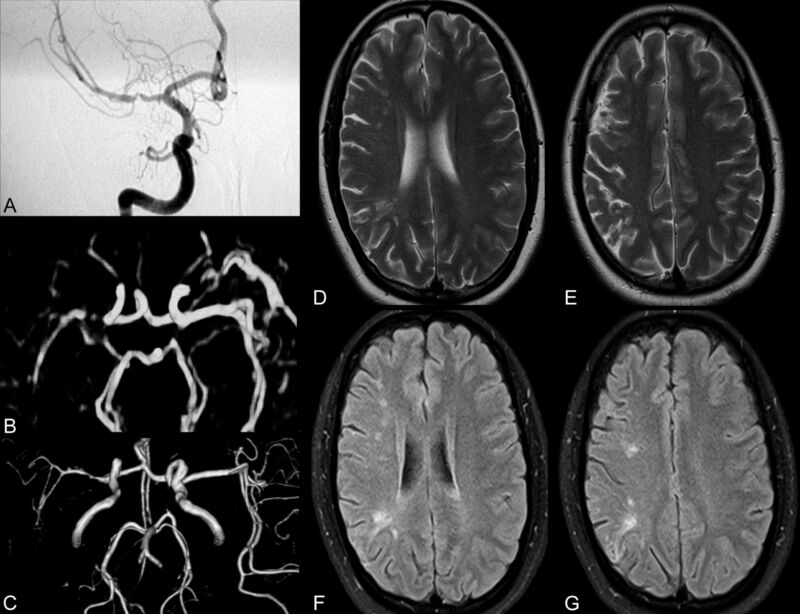 Future developments in high-resolution MR imaging to depict intracranial atherosclerosis are explored in this review; these advances will guide endovascular therapy and the comparison of novel interventions. Stroke is a common cause of morbidity and mortality, with cerebrovascular disease constituting the second most frequent cause of death worldwide.1 While the burden of cerebrovascular disease in the developing world is receiving greater attention, its importance is underestimated.2 Intracranial atherosclerotic disease is reaching greater clinical prominence as potentially the greatest contributor to the burden of cerebrovascular disease worldwide.3 Previously, atherosclerotic disease within intracranial vessels was not well-appreciated clinically, perhaps due to the inability to visualize the MCA noninvasively or the greater emphasis on the more easily imaged carotid arteries. In an early study of MCA syndromes, Lhermitte et al4 alleged that “atherosclerotic thrombosis of MCA is probably a rare event and the primary cause . . . lies in the proximal ICA . . . for an almost inaccessible artery appears to be of little significance.” Thus, early investigations established a precedent of emphasizing extracranial atherosclerosis at the expense of investigation of other manifestations of cerebrovascular disease. In examining only extracranial disease, investigators may be detecting only advanced atherosclerosis. Some argue that MCA disease may precede extracranial atherosclerosis; this sequence is suggested by the lack of substantial carotid stenosis in a group of patients with intracranial atherosclerosis, while nearly all those with extracranial stenosis also had concomitant intracranial stenosis.5 Therefore, detecting intracranial atherosclerosis may enable clinicians to intervene earlier. There is much controversy about the degree of MCA stenosis responsible for stroke, with some groups arguing that MCA stenosis is not important in the white population on the basis of a small TCD sonography study.6 Yet a host of postmortem and imaging studies implicate MCA atherosclerosis as a likely cause of stroke.7⇓–9 Further investigation is necessary to evaluate the prevalence and importance of MCA disease as an etiology of ischemic injury. The incidence of intracranial atherosclerotic disease in the general population is poorly understood; knowledge about the occurrence of this pathology is inferred from a few postmortem studies of patients with stroke. Early studies investigating intracranial atherosclerosis purported that this disease process was an infrequent cause of stroke and potentially discouraged much-needed investigation.4 Recent studies challenge these notions claiming the rarity of intracranial atherosclerosis. A substantial study of >300 stroke fatalities in Paris showed that intracranial atherosclerotic plaque occurred in 59% of patients and 37.2% of all patients had intracranial plaque that was stenotic.8 Specifically, the MCA was diseased in 28.9% of fatal stroke postmortem examinations; of these, roughly half of the plaque was 30%–74% stenotic and one-quarter of the plaque was severely stenotic (>75%) or completely occlusive.8 Another postmortem study of patients with MCA territory stroke detected MCA stenosis on the ipsilateral side in 19% and on the contralateral side in 7% of cases.7 Thus, MCA disease appears frequently in fatal stroke in certain cohorts and may cause substantial stenosis in many patients. Clinical population studies also bear out the substantial impact of MCA disease in certain populations. A high incidence of intracranial stenosis is reported in African, Asian, and Hispanic populations, but not in whites.9 In a study of 850 Korean patients with ischemic syndromes, 12.6% were found to have isolated MCA disease16; an even larger study found that MCA stenosis was the most common type of atherosclerotic lesion in approximately one-third of patients with stroke.20 MCA stenosis was identified in 36% of Korean patients with small striatocapsular infarcts.13 Estimates of the responsibility of intracranial stenosis in causing stroke are 33%–50% in China.9,21,22 Asymptomatic patients with vascular risk factors also frequently have significant degrees of intracranial stenosis. TCD sonography identified MCA stenosis in 12.6% of at-risk individuals in a study conducted in Hong Kong.23 Therefore, while estimates vary widely, MCA disease appears quite common in several large cohorts. As suggested by the results of a large postmortem study, stroke history appears to be associated with intracranial stenotic plaque, not simply the presence of nonstenotic atherosclerotic plaque.8 Stroke risk with severe intracranial artery stenosis appears related to the degree of stenosis with a hazard ratio of 2.03 (P = .0025) of symptom recurrence for severe (≥70%) stenosis.24A prospective study of MCA disease found a 12.5% annual risk of stroke in symptomatic patients and a 2.8% annual risk in asymptomatic individuals with significant MCA stenosis or occlusion25; similarly in symptomatic patients, the Warfarin-Aspirin Symptomatic Intracranial Disease trial found an 18.6% recurrence during approximately 2 years of follow-up.26 These recurrences occurred more frequently in the same territory as the initial symptoms (73%); more concerning, almost half of these strokes were disabling.26 Because the progression of MCA stenosis appears to be quite common, suggested by 61% serial angiography progression of stenosis during approximately 2 years, routine monitoring of stenosis with time may be even more important than in carotid disease.27 Knowing the prognosis of particular types and degrees of stenotic MCA disease is important in determining target populations for angioplasty, stent placement, or medical management. Currently, management of MCA stenosis is generally decided on symptom status: Asymptomatic patients typically receive platelet inhibitors such as aspirin or clopidogrel and symptomatic patients are prescribed anticoagulation.25,28,29 Much uncertainty regarding the ideal medical management of MCA stenosis exists and varies by patient characteristics; some argue that asymptomatic MCA atherosclerosis carries little risk,30 whereas previously symptomatic patients with intracranial atherosclerosis have a particularly high recurrence risk if they fail antithrombotic therapy.31 Regardless of symptom status, risk-factor modification to address vascular risks is of paramount importance in preventing all-cause morbidity and mortality, especially because MCA stenosis in patients with diabetes is an independent predictor of vascular mortality.32 Large studies examining treatment effects in individuals with MCA stenosis are needed to guide appropriate medical management. Severe stenosis with recent symptoms carries much greater risk than asymptomatic stenosis and may necessitate endovascular therapy, including stent placement as reviewed at greater length by Turan et al.33 Some groups recommend urgent endovascular therapy for patients with impending stroke who have failed best medical therapy.34 Angioplasty has been the most common endovascular therapy for intracranial stenosis and may have some ability to reduce the risk of stroke in selected patient populations, with an annual stroke rate of 3.36%.35⇓–37 Studies of endovascular therapy show that stent placement can be performed with high success and low adverse event rates within the MCA and that stent placement reduces residual postoperative stenosis compared with angioplasty.38⇓–40 The clinical importance of recanalization by stent placement or angioplasty in reducing stroke or risk of death remains to be decided; current evidence is summarized by Gröschel et al.41 Another option for restoring blood flow in MCA disease is superficial temporal artery−MCA bypass, which appears to have some success in medically refractory symptomatic patients and improves perfusion.42,43 To resolve these pressing questions, larger long-term prospective clinical trials of therapy for MCA stenosis are needed, particularly in asymptomatic patients, to ascertain the ability of medical therapy to prevent the development of ischemic symptoms. Most early imaging studies of the MCA have focused on assessment of lumen status and have been largely reliant on invasive DSA or CTA. More recently, the degree of stenosis has been determined on the basis of flow velocity calculated from TCD sonography; this method offers fair assessment of MCA stenosis and may have a place in clinical practice in identifying patients requiring detailed imaging methods such as high-resolution MR imaging.44⇓–46 Limitations of these methods include the small risk associated with nonionizing radiation in traditional and CT angiography and limited repeatability and low sensitivity in the case of sonography.47 DSA should play little role in modern imaging because it is invasive, exposes patients to a substantial amount of radiation, and provides no information about the cerebral parenchyma or the vessel wall. Noninvasive imaging of the MCA with MR imaging may offer benefits, including excellent spatial resolution of the vessel wall, avoiding radiation use, incorporation with stroke imaging protocols, and excellent repeatability. With the use of increasingly advanced imaging, it may be found that previously idiopathic stroke cases were associated with intracranial plaque not seen by conventional angiographic imaging methods. The detection of stenosis within intracranial vessels such as the MCA appears best accomplished via noninvasive screening methods such as MRA and CTA. The criterion standard, DSA, should be regarded as too invasive to screen for stenosis following ischemic events despite its greater level of spatial resolution. TOF MRA was first compared with DSA in the 1990s, showing up to 100% detection of intracranial artery occlusion.48,49 Since then, this technique has rapidly emerged as a common means of imaging the intracranial arteries noninvasively without using gadolinium; TOF MRA takes advantage of the contrast between nonsaturated spins in the blood entering the imaging plane and the stationary adjacent tissue, which remains saturated. A later study reported much poorer performance of MRA in detecting intracranial stenosis, with a sensitivity and specificity of 70% and 99% versus 98% and 98% for CTA.54 An earlier comparison of CTA and MRA suggested that interpretation of MRA is more reliable than that of CTA.55 Higher field strength scanners may carry additional benefits in improving signal intensity–to-noise ratio and background suppression; other sequences, such as novel sensitivity encoding TOF MRA protocols, also have substantially abbreviated acquisition times.56,57 In a trial of 3D TOF MRA of intracranial steno-occlusive disease in 139 patients on a 3T scanner, 2 observers demonstrated 78%–85% sensitivity and 95% specificity in detecting >50% stenosis and 100% and 99% sensitivity and specificity for the detection of complete occlusion with excellent interobserver agreement.58 Figure 1 depicts the correspondence of contrast-enhanced MRA, TOF MRA, and DSA in a patient with recent ischemic lesions seen on brain imaging. Comprehensive imaging of a patient with recent stroke depicting left MCA stenosis. 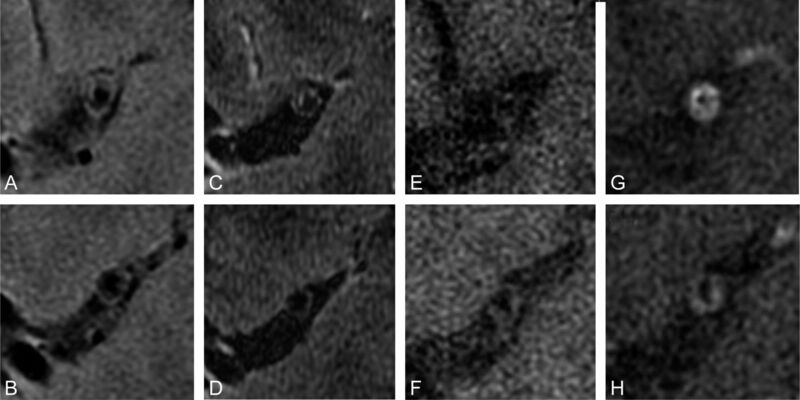 A−G, DSA (A) confirms contrast-enhanced MRA (B) and volume-reduced TOF MRA (C) findings of severe stenosis within the right MCA in a recently symptomatic patient with small ischemic lesions seen on T2 (D and E) and FLAIR (F and G). MRA (B and C) overestimates the degree of stenosis in this particular case. Another novel application of MRA is the evaluation of intracranial in-stent stenosis with quantitative MRA by using TOF MRA and phase-contrast MR imaging to measure blood flow. In a study of 14 patients with intracranial stents, quantitative MRA results matched DSA findings in the case of a restenosed MCA stent66; these authors used quantitative MRA to demonstrate the hemodynamic effects of stent placement.67 Thus, MRA of the MCA already shows promise in monitoring the response to pharmacologic and surgical intervention, but rigorous investigation of these new applications of MRA is needed. Conventional angiographic methods including MRA and CTA provide detailed information about the lumen status of the intracranial vessels, including the MCA. These methods, however, fall short in characterizing the presence of nonocclusive atherosclerotic disease; this requires visualization of plaque and the ability to derive information about plaque composition. There are a variety of reasons why detection and depiction of nonstenotic atherosclerotic disease is of paramount importance, as has been advocated in the case of carotid atherosclerosis.68 Even large plaques may not cause discernable stenosis because of arterial wall remodeling and expansion, which thereby obfuscates findings by angiographic and luminology methods.69 Clinically, atherosclerosis, yielding a low degree of stenosis, can still confer an enhanced risk of symptoms in extracranial atherosclerosis; this assumption may be accurate in intracranial disease.3 Neovascularization and lipid area were associated with greater risk than stenosis in a postmortem study.17 In a small study of patients with MCA disease, high-resolution MR was able to image a small plaque that did not yield stenosis on MRA; high-resolution MR imaging may provide detailed information about smaller degrees of stenosis than other imaging methods.70 Detection of these small lesions may carry clinical import because rupture of a nonocclusive plaque potentially causes ischemic symptoms via a thromboembolic pathway. There are limitations to such a calculation because the use of a reference site is dependent on the tortuosity of the MCA and factors related to section selection such as the particular region of the MCA imaged and the imaging parameters, section spacing, and section thickness. One potential means of ascertaining the normal lumen measurement for a specific site of stenosis is to image the equivalent segment of the contralateral MCA as implied by others73; this method is equally subject to artifact and, furthermore, presumes unilateral disease. Multicontrast high-resolution MR imaging of a normal MCA. Sagittal high-resolution MR imaging of the MCA in a healthy volunteer demonstrates the ability of multiple sequences to depict the arterial wall and lumen in detail. Multispectral high-resolution MR imaging of a symptomatic patient with MCA disease. T2-weighted (A and B), spin-echo inversion recovery (C and D), T1-weighted (E and F), and postgadolinium T1-weighted (G and H) images depict a large eccentric contrast-enhancing plaque within the lumen of a recently symptomatic patient on the ipsilateral side of symptom presentation. Focal enhancement with contrast administration may potentially identify hemorrhagic plaque composition within the MCA, but in 1 small study, only approximately 15% of patients had enhancement as exemplified in Fig 3G, -H.79 Enhancement could potentially be used to indicate the risk of plaque causing symptoms; however, an earlier study of just 6 patients with known MCA stenosis found that both asymptomatic and remotely symptomatic patients demonstrated gadolinium enhancement of plaque.73 A bright arterial wall on unenhanced FLAIR T1 may be seen in acute hemorrhage or dissection of the MCA.79 In 1 case study, bright T1 hyperintense signal intensity (relative to the adjacent pterygoid muscle) within an MCA plaque was seen in a recently symptomatic patient, implicating intraplaque hemorrhage as the likely cause of this patient's symptoms.76 Because there are no validated imaging appearances for plaque components in the MCA, the actual ability of high-resolution imaging to discern particular components remains tentative. The investigation of the MCA should consist of parasagittal sequences oriented perpendicular to the direction of the MCA; these sequences may be directed specifically to image the site of highest degree of stenosis seen on previously acquired MRA images or to nonspecifically sample the vessel of interest (ie, the symptomatic side of the MCA). Because atherosclerosis is a systemic disease and the literature reports contralateral stenoses frequently, the asymptomatic side of the MCA should also be imaged, though the clinical usefulness of this strategy to detect asymptomatic lesions is still unproven.83 In this protocol, we recommend using T1, T2, short tau inversion recovery, FLAIR T1, and fast spin-echo proton-attenuation−weighted sequences for the purpose of providing multispectral characterization of the arterial wall plaque in a manner similar to that validated in carotid MR imaging.84,85 Figure 2 depicts the appearance of these high-resolution sagittal MCA sequences in a healthy volunteer. Contrast-enhanced T1 sequences may be useful in offering better contrast between the fibrous cap and lipid-rich necrotic core atheroma and may also correlate with vulnerable plaque and the risk of symptoms as suggested in the carotid imaging literature. However, the benefit yielded by the use of contrast enhancement in the MCA is uncertain at present because there is no compelling evidence of contrast aiding in the detection of atherosclerotic disease within the MCA. Wider adoption of high-resolution MR imaging of the MCA for the evaluation of patients with ischemic symptoms has the potential of altering presently held assumptions about the extent of intracranial atherosclerosis as a causative factor in stroke. The application of alternate MR imaging techniques—such as nanoparticle contrast agents targeted to plaque components and the use of dynamic contrast-enhanced imaging to detect neovascularization—could yield even more detailed depiction of the plaque constituents. All of these proposed means of segmenting MCA plaque into its components must be validated.86,87 One means is to examine the postmortem histology of patients previously imaged, but a more feasible, though not ideal, alternative is to use quantitative imaging methods to match the plaque component values from MCA imaging with those histologically validated values in carotid artery imaging. Unfortunately, the progress gained in the research setting may not reach the clinical arena easily. Several practical limitations hamper clinical use of high-resolution MR imaging of the MCA: The requirement of a 3T scanner and technical expertise restricts these studies to tertiary academic medical centers, and the section selection of regions of the MCA for sagittal acquisition necessitates the involvement of well-trained technicians and active input from neuroradiologists. Additional studies of the reproducibility of high-resolution MR imaging of the MCA are needed to ensure that intracranial atherosclerosis can be followed with serial imaging with time: Evidence of excellent reproducibility would support the use of high-resolution MR imaging in this setting to track disease progression and response to therapy. Moreover, although the mere detection of MCA disease in symptomatic patients does not connote causality, prospective studies examining MCA status and the risk of subsequent events could reveal important associations between high-resolution MR imaging findings and clinical risk. MCA atherosclerosis is increasingly recognized as an important contributor to the risk of stroke worldwide. MRA can offer evaluation of MCA stenosis with good accuracy compared with DSA but still only provides information about vessel patency alone. High-resolution MR imaging offers additional insight into atherosclerotic disease within the MCA by visualizing the arterial wall and plaque constituents. Additional work to correlate imaging findings with risk of future outcomes is necessary to offer clinical significance. World Health Organization. Causes of Death. Geneva, Switzerland: World Health Organization; 2004. http://www.who.int/healthinfo/global_burden_disease/GBD_report_2004update_part2.pdf. Accessed September 15, 2011.